inflammation of the meninges, usually by either a bacterium (bacterial m.) or a virus (viral m.). When it affects the dura mater it is termed pachymeningitis; when the arachnoid and pia mater are involved, it is called leptomeningitis. The term meningitis does not refer to a specific disease entity but rather to the pathologic condition of inflammation of the tissues of the meninges. The etiologic agent can be anything that activates an inflammatory response, including both pathogenic and nonpathogenic organisms, such as bacteria, viruses, and fungi; chemical toxins such as lead and arsenic; contrast media used in myelography; and metastatic malignant cells. Enteroviruses are the most common causes of aseptic meningitis. Bacterial Meningitis. This form occurs when pathogenic bacteria enter the subarachnoid space and cause a pyogenic inflammatory response. The most common causes are Streptococcus pneumoniae (pneumococcus), Neisseria meningitidis (meningococcus), and Haemophilus influenzae, which are responsible for approximately 70 per cent of all cases. The incidence is age-related. In adults, S. pneumoniae and N. meningitidis cause most of the cases; in children aged 1 month to 15 years, N. meningitidis and H. influenzae predominate; in neonates less than 1 month old, the disease is usually a nosocomial infection with gram-negative enteric bacilli. Almost all bacterial infections of the meninges enter the nervous system after having invaded and infected another region of the body and then are spread by local extension, as from the sinuses, or through the blood, as in septicemia. The organisms gain access to the ventriculosubarachnoid spaces and the cerebrospinal fluid where they cause irritation of the tissues bathed by the fluid. Bacterial meningitis typically begins with headache, nausea and vomiting, stiff neck (nuchal rigidity), and chills and fever. Irritability and confusion occur early in the course of the disease, and convulsive seizures occur in about 25 per cent of patients. As the disease progresses the patient becomes less rational, has decreasing levels of consciousness, and lapses into coma. Inability to straighten the knee when the hip is flexed (a positive kernig's sign) and involuntary flexing of the hip and knee when the neck is flexed forward (a positive brudzinski's sign) are indicative of meningeal irritation. A diagnosis of bacterial meningitis is verified by isolation of the organism from a specimen of cerebrospinal fluid obtained by lumbar puncture. Treatment with the appropriate antibacterial agent is begun at once to reduce the numbers of proliferating bacteria attacking the central nervous system. Supportive measures include rest, maintenance of fluid and electrolyte balance, and prevention or control of convulsions with anticonvulsant drugs. The prognosis is generally good, especially for meningococcal meningitis in which residual neurologic deficits and persistent convulsive seizures are rare. Pneumococcal meningitis and meningitis due to Haemophilus influenzae are more likely to be complicated by these sequelae as well as by septic shock and hydrocephalus. Benign Viral Meningitis. This term encompasses a group of disorders in which there is some meningeal irritation but no pyogenic organism can be found in the cerebrospinal fluid. It is, therefore, called also aseptic meningitis complex, which is somewhat misleading because the meningeal irritation often follows infection with the mumps virus or with one of the picornaviruses. The patient with this disorder typically complains of headache and signs characteristic of meningeal irritation, intolerance to light, and pain when the eyes are moved from side to side. Most of the symptoms are mild, and treatment is largely supportive and symptomatic; the disease is self-limiting. Patient Care. Assessment of the patient with meningitis includes monitoring vital signs, neurologic status, and fluid and electrolyte status. The plan of care should include provisions for rest and relief from discomfort, a quiet and nonstimulating environment, protection from injury during convulsions, control of elevated body temperature, and isolation precautions as indicated by the specific causative organism. In general, enteric precautions are indicated for patients with aseptic meningitis caused by an enterovirus. Fungal and meningococcal meningitis require respiratory precautions. Antibiotics must be given precisely as ordered so as to avoid further damage to the central nervous system. Early signs of increased intracranial pressure from brain edema are reported promptly so that measures to reduce pressure can be taken as soon as possible. During the acute phase and convalescence the patient is watched for signs of complications such as septic shock, vascular collapse, and hydrocephalus. Nutritional status must be maintained throughout the course of illness to reinforce the patient's natural resources for combating infection and recovering from its deleterious effects. 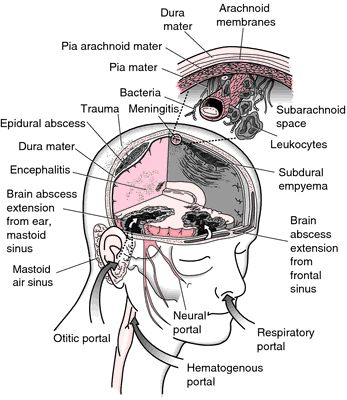 Portals of entry resulting in meningitis, meningoencephalitis, and intracranial mass lesions. From Mahon and Manuselis, 2000.
aseptic meningitis any of several mild types of meningitis, most of which are caused by viruses; see viral meningitis. bacterial meningitis meningitis caused by bacteria; common pathogens are Haemophilus influenzae, Neisseria meningitidis, Streptococcus pneumoniae, and Mycobacterium tuberculosis. Some types may be serious, acute, or even fulminating. See also viral meningitis. cerebrospinal meningitis an inflammation of the brain and spinal cord; it may be caused by any of numerous different organisms. epidemic cerebrospinal meningitis an acute infectious disease with seropurulent inflammation of the membranes of the brain and spinal cord, due to infection by Neisseria meningitidis (meningococcus). It usually occurs in epidemics, and symptoms are those of acute cerebral and spinal meningitis. There is also usually an eruption of erythematous, herpetic, or hemorrhagic spots on the skin. The fulminating or malignant form is known as Waterhouse-Friderichsen syndrome. spinal meningitis inflammation of the meninges of the spinal cord. viral meningitis meningitis due to any of various viruses, such as a coxsackievirus or the mumps virus, with lymphocytes in the cerebrospinal fluid. It usually has a short uncomplicated course characterized by malaise, fever, headache, stiffness of neck and back, and nausea. See also aseptic meningitis. an inflammation of the meninges that is caused by one of a number of viruses, including coxsackie viruses and echoviruses (which account for about half the cases), nonparalytic polioviruses, and mumps, or may be drug induced, such as with high-dose IV immunoglobulin. Viral meningitis is especially common in children during the late summer and early fall. In about one third of the cases no pathogen can be demonstrated, but analysis of cerebrospinal fluid reveals increased numbers of white blood cells, usually lymphocytes; normal glucose concentration; slightly elevated protein levels; and no bacteria. Symptoms vary, depending on the causative agent and may include fever, headache, stiff neck and back, nausea, and skin rash. No specific treatment is available. Supportive therapy is directed to maintaining hydration and controlling fever. Complete recovery, without complication or residual effect, is usual. See also viral meningitis. Microbiology Nonpurulent meningeal inflammation, which is more common in those under age 30. Aetiology Viruses, especially Coxsackievirus and echovirus, circumscribed bacterial infections, haemorrhage, neoplasia (e.g., leukaemia and lymphoma), chemical or mechanical irritants. Clinical findings Headache, stiff neck or back, nausea, vomiting, fever, photophobia, pain on eye movement; more common in late summer. Lab CSF pleocytosis, increased lymphocytes. Management Empiric antibiotic coverage, antivirals, and antifungals; use of corticosteroids is controversial. Neurology A progressive life-threatening form of meningovascular neurosyphilis which may occur in untreated syphilis. Clinical findings Headaches, mental changes, decreased nerve function (e.g., vision, movement, or sensation), vascular symptoms (e.g., stroke). Infectious disease Nonpurulent meningeal inflammation, which is more common in those < age 30 Etiology Viruses, especially Coxsackievirus and echovirus, circumscribed bacterial infections, hemorrhage, neoplasia–eg leukemia and lymphoma, chemical or mechanical irritants Clinical Headache, stiff neck or back, N&V, fever, photophobia, pain on eye movement; more common in late summer Lab CSF pleocytosis, ↑ lymphocytes Management Corticosteroids may be effective. Cf Purulent meningitis Neurology A progressive life-threatening form of meningovascular neurosyphilis which may occur in untreated syphilis Clinical Headaches, mental changes, ↓ nerve function–eg, vision, movement or sensation, vascular Sx, eg stroke. See Neurosyphilis, Syphilis. 1. Inflammation of the MENINGES resulting from contact with various toxic or irritating substances such as blood, air, drugs or chemical irritants but not bacteria. 2. An obsolescent term for MENINGITIS caused by organisms that do not produce pus, or for viral meningitis. Enterovirus-D68 in the cerebrospinal fluid of two children with aseptic meningitis. Detection of EV, HSV, and VZV were highest in this group and were associated with cases of encephalitis as well as aseptic meningitis. But for the children with higher fevers without hand/foot/mouth or stomatitis, the costs of care escalated as tests were much more often performed (CBC, chest x-ray), and medications prescribed (antibiotics for uncertain diagnosis in the context of high fever), and occasional referrals made to the emergency department for further work-up (100% of cases of aseptic meningitis and 50% of cases of pleurodynia). Longitudinal myelitis, aseptic meningitis, and conus medullaris infarction as presenting manifestations of pediatric systemic lupus erythematosus. 9 yrs) and patients of aseptic meningitis ranged from 2 yrs. There are few cases reported with aseptic meningitis in a patient with mycoplasma pneumonia, according to our research there is a scarcity of reports from Saudi Arabia. The other cases were considered as aseptic meningitis. A facial palsy may also develop during the early stage, as well as aseptic meningitis. CSF analysis was notable for an aseptic meningitis with an elevated protein of 80 mg/dl (normal (15-45 mg/dl) and 20 white blood cells (92% lymphocytes). Signs of Lyme disease at this stage include multiple erythema migrans, symptoms of a flulike illness, aseptic meningitis, neuritis, and carditis. CSF RE findings were consistent with aseptic meningitis. In our case, isolated lymphadenopathy was detected in the right posterior cervical region with MR, which was ordered for the evaluation of aseptic meningitis.